This new cutting-edge technology is a self-emitting TV with micrometer (µm) scale LEDs – which are much smaller than current LEDs, and serve as their own source of light. 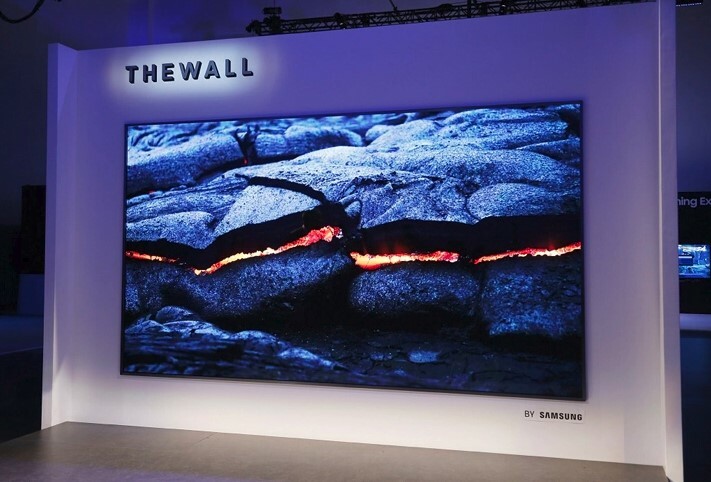 According to Samsung.com The MicroLED screen excels in durability and effectiveness, including luminous efficiency, the light source lifetime and power consumption, setting the standard for future screen technology. Samsung the Wall represents how consumers can customise their television sizes and shapes to suit their needs. The screen can adapt to serve different objectives, such as creating a wall-size display for multiple spaces. According to Samsung.com “Samsung also featured the world’s first QLED TV featuring 8K AI technology, which will be launched internationally, starting with Korea and the US during the second half of 2018. This AI technology upscales standard definition content to 8K resolution. It employs a proprietary algorithm to adjust screen resolution based on picture quality characteristics of each scene, to continuously improve picture quality and easily transform any type of content from any source into a high-resolution 8K”.